Yet another bike rider won’t be coming home to his family this Christmas. 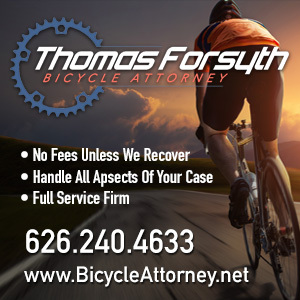 Earlier this evening, Orange County cyclist Ed Ryder emailed me with news that a bicyclist had lost his life in a Laguna Hills collision — news that has since been confirmed by the Orange County Register. 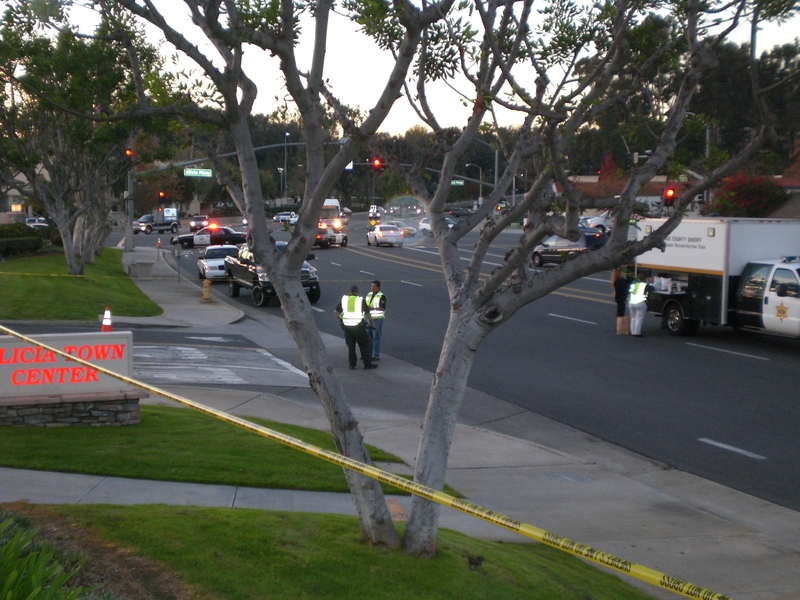 The victim, who has not been publicly identified, was apparently leaving the Ralphs parking lot on the westside of Paseo de Valencia south of Alicia Parkway when he was struck by a vehicle. The Register says he collided with the vehicle, which seems unlikely. Judging from the photo of the bike, it looks more like a side impact; the front wheel isn’t tacoed, while the rear wheel appears to have been separated from the bike. Unfortunately, no other information is available at this time; most of the Register’s story is hidden behind their paywall. 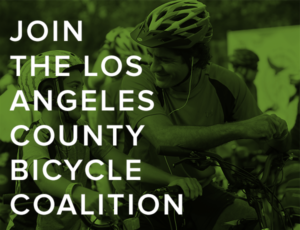 This is the 85th confirmed bicycling fatality in Southern California this year, and the 12th in Orange County; that compares with 74 and 14, respectively, in 2012. There is also an unconfirmed report that a rider doored in LA’s Brentwood neighborhood earlier this month has died. Update: Every bicycling death is tragic, but this one seems even more so. And not just because it happened on Christmas Eve. 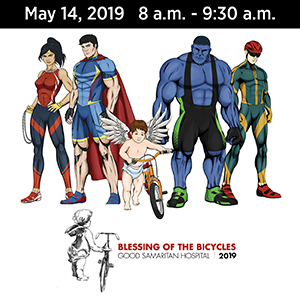 According to the Orange County Coroner’s office, the victim was 82-year old cyclist Peter Tomaino, profiled by Orange County Register columnist David Whiting as OC’s toughest cyclist. According to Whiting, Tomaino was a minimum 100-mile a week rider, even at an age when most riders have permanently parked their bikes — despite being hit by cars and other cyclists, and crashing so many time he’d lost track of the number of times he’s been hospitalized. Sadly, he got his wish yesterday. Thanks to Ed Ryder and an anonymous OC source for the head’s up. My deepest sympathy and prayers for Peter Tomaino and his loved ones. Update: According to KCBS-2, the collision occurred around 1:45 pm Tuesday; he was declared dead at Mission Hospital Regional Medical Center in Mission Viejo at 1:58 pm. The station reports the driver was not suspected of drug or alcohol use. Meanwhile, both Ryder and OC cyclist and attorney David Huntsman point us to this letter Tomaino wrote to Cycling News over a decade ago. I read Gordon Dillow’s article on drivers that are in a hurry and run through red lights. Believe me I can appreciate what he is talking about. I’m a 70 year old cyclist who is out there every other day riding 50 to 60 miles. I had one serious accident because of a driver running a red light. A lot of drivers have no consideration and don’t realise how vulnerable we cyclists are. So please drivers look out for us cyclists and let us enjoy our rides without the fear of being hit. Update 2: David Whiting of the Orange County Register movingly remembers his fallen friend. Correction: My apologies to OC Register’s David Whiting, who I misidentified as Dan in my rush to get this story online — then repeated my error in the comments. Another possibility is a wreck where the cyclist is hit but not the bike. These can cause serious injuries or death and barely or never touch the bike. Or someone could have been playing with the rear wheel quick release and the cyclist lost the rear wheel and slid (minus the bike) into traffic after applying the rear brake at the end of the drive. That’s another reason to do the ABC Quick check any time you get on a bike that has been parked in a location not under your control. Our prayers go up this Christmas for the family and friends of Mr. Tomiano. I’m so sorry, my thoughts are with the family. I cannot stop thinking of Mr. Peter Tomaino as I happened to drive up before the ambulance and fire truck got there. I was very happy to see how many people actually stopped to try and help. My thoughts and prayers go out to the family. He was a man of incredible drive and determination. He had a heart of gold and was loved by many. Pete you will surely be missed. May the Lord God and our savior richly bless you in heaven. Looking forward to the day when we meet again. Just looking at that street churns my stomach. Town center? More like asteroid belt suburb ring. I know that bike. How much he loved and cared for that bike. Makes me sick just to see it there, mangled and alone. Wow so sad. Right outside my old neighborhood and across from my old high school. Prayers have been sent. I went there, too. I knew right away that’s where the Pizza Hut was. It was a place that worshipped the almighty car then, and it’s moreso now. We always worried about him being out there in that. With good reason. When I see other places who are so much more bike-friendly (we’re near Portland now), where so much more accommodation is made to encourage people to bike, not ride, it just chills me that an area with such a massive tax base simply does not care about protecting, much less encouraging, cyclists. I’ve known Pete my whole life. The idea that he hit a vehicle is utter crap. My parents have known Pete since before I was born, 47 years ago. Pete is the reason my own dad, 81, is alive today, because when my dad was exactly my age, Pete made him start to run. Whereas Pete got on a bike, my dad went on to marathon three times and win countless 10 and 5Ks, even at an advanced age. At 81, he still runs. Whenever Pete was hit on his bike before, it was always because someone else hit him. One could surmise that since Pete was hit so often, that he was an aggressive biker or unsafe. However, given the sheer number of miles he rode, over 150,000 on the bike he died on, it was just a bad numbers game. And Orange County is NOT biker-friendly. Everyone thinking their damned destination is more important than anything else. Pete and my dad are proof of what an athletic lifestyle and never quitting can do for your old age. As of two days ago, both of them were in incredible physical shape. Not just for their age, either. My dad was fat when Pete pushed him to start running. He has never been fat since, nor has he ever had high cholesterol, or any of a host of health issues people 20 years younger have. Two days ago, both men were prime specimens. Now, thanks to the hustle and bustle of an area that just refuses to slow down, one of them gets a closed casket funeral. Thanks for the comment, David. I was hoping we’d hear from you. Please accept my sympathy for the loss of your friend, and thank you for bringing his story to our attention; without you, we would’t know what a treasure we’ve lost. I think we’ll all look forward to your follow-up. My apologies, David. I know your name, and had it right there in front of me. How I could have gotten it wrong is beyond me. Please forgive my rudeness and sheer stupidity. Dude of dudes – no worries. You do a terrific and critical job with your excellent site. Thank you for your service. 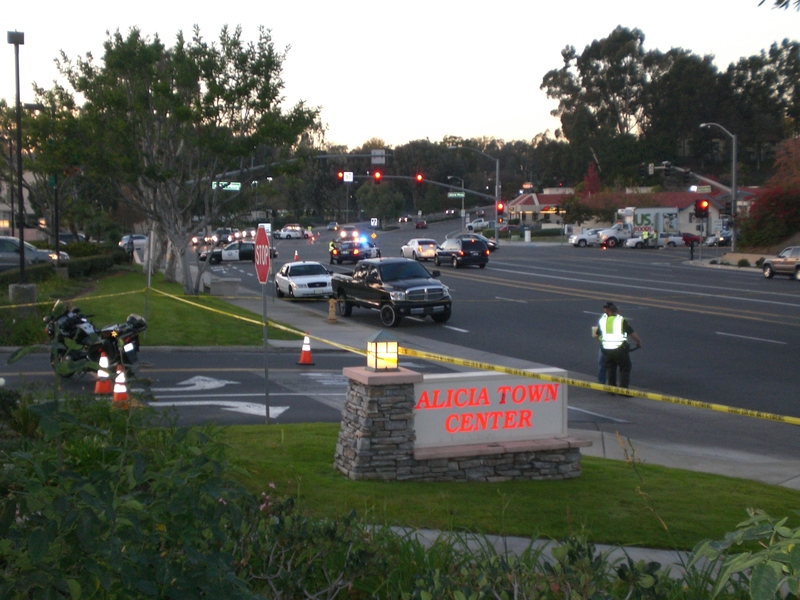 My husband and I were driving down Alicia Parkway heading Northeast and we were stopped at the red light at Paseo de Valencia. An older man was riding his bike heading East on Paseo de Valencia with traffic. He rode his bike directly in front of our car as we were the first car at the crosswalk. We both commented on what phenomenal shape this elderly man was in, that we had figured had to be in his late 70’s early 80’s, and that we were happy to see him riding his bike. We were on our way to a late lunch and then one of the Christmas Eve services at Saddleback Church. The light turned green for us and as we were driving through the intersection my husband looked to the right and noticed that the elderly man was laying on the ground in the middle of the street. We had to continue going through the intersection and had to find a street that would allow a U-turn. By the time we got back to where he was, which was literally 2- 3 minutes, the firetrucks were there and police and an ambulance came shortly thereafter. Apparently, there was another accident less than a block away so they were there immediately. This happened, literally, just a few seconds after we had commented on what great shape he was in for his age and how wonderful it was that he was riding his bike. We parked our car in the Ralph’s parking lot and got out and walked up to a woman to ask what happened. She told me that she was the one that hit him – she was devastated. She said that she parked her car and left it running and got out to see what had happened. The police came over to ask who had actually seen the accident – we did not see it – we just saw him laying on the ground. When my husband saw him laying on the ground as we drove through the intersection a large red bus was at the curb picking up/dropping off passengers so my husband had a clear view of the elderly man laying on the ground in the middle lane. We believe the bus was the last vehicle to pass through the intersection in the right most lane traveling in the same direction as the bike rider (the elderly man). By the time we got back to where this elderly man was laying in the street the bus driver had pulled the bus in front of the elderly man, we would have to assume so he/she did this so that no other car would run over the man. From this, we believe that the bus driver did not hit him. We would have to assume that the bus has cameras on the front where the police can see how this accident happened. The police came over and asked who saw the accident and the woman who hit him said she was the one that hit him but didn’t know how or where he came from. She showed the police officer where she had left her car running and he walked her to her car and told her to get into her car to calm down. I had asked another woman if she saw what had happen and she said no and that she was on her way to Ralphs and she saw the man laying on the ground and she called 911 immediately. As we said, he rode his bike across the intersection in front of us and within seconds he was laying down on the ground just past the exit of the Ralph’s parking lot. We couldn’t figure out what happened. We thought that possibly he had a heart attack and veared off into the middle lane or the person coming out of the Ralph’s parking lot hit him. There were no skid marks that we could see and his bike was not mangled up – just a wheel was off. He was laying at least 10 – 15 feet from his bike. The woman that called 911 said that he was in a fetal position when she got there and the fireman rolled him over to do chest compressions. We knew that it wasn’t good as they kept doing chest compressions and then they used the defibrillator once or twice. Another woman ran to the ambulance and wanted to pray for this man in the ambulance and was turned away because they had to leave immediately. My husband and I and the woman who called 911 all held each other and prayed for this man and his family and that God watch over him. When we got to Saddleback we asked that a pastor pray for this man and his family as well. My husband looked up online today to see how this man was doing and found out that he passed away. Our hearts are broken over this very sad news. We don’t live in Laguna Hills – we live in San Diego but go to Saddleback every now and then. We pray for you and your family and we pray this man’s family. We are Christian and pray that you know that your loved one is the loving warm arms of Jesus right now. We pray that this gives you peace and some sort of comfort. May God watch over you and Bless You! Ken, Cathy – Thank you for sharing. I’m the Page One columnist at the Orange County Register, have written two columns about Pete (2008, August this year), had lunch with him regularly for more than five years…I’d like to chat. my email is [email protected], phone 714-796-6869. With appreciation, David. Can you tell me where in the traffic lane you saw the cyclist when he was riding? Was he riding in the left or right lane? How far from the curb? Was he riding his bicycle in the same position a car would drive? Or was he riding his bicycle to the right near the curb? 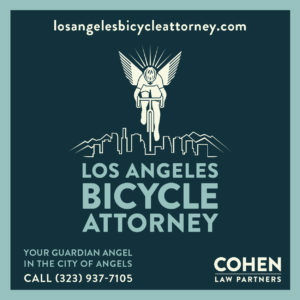 I investigate bicycle fatalities and report to make all cyclist safer. Thank you. Very sorry to hear the sad ending to Mr. Tomaino’s life. Never giving up or quitting something you love because you hit a certain age is living a life worth living. Thoughts and prayers to you sir and for those dear family and friends that will no longer have you with them. I echo Carrie’s and worry that more will meet their fate the same way. Orange County still struggles with motorist more concerned with the fastest way to get from point A to point B while they talk, text, apply makeup, shave, dress, eat, drink, smack/yell at the kids all possibly under the influence of drugs or alcohol. Hey OC Sups – how many more? I pray for Tom and his family. Cyclists whenever you can try to ride in designated bike lanes on city streets. Is much safer for you and makes the environment safer for the driver as well. Sometimes it seems that cyclists think they are the only ones out there. Same goes for some drivers. Perhaps you can tell me how a bike lane would have made a damn bit of difference in this case. Especially since the victim was — legally — crossing a street in the middle of a block. Or maybe that Aussie who was killed by the “distracted” driver on Temescal Canyon. Or maybe the 8 others in the OC who have lost their lives the same way. Pete, was very proud of the fact he would take on the OCW Ride Around the Bear every year and for many years would be the oldest finisher. He was truly an inspiration for all to stay fit and challenge yourself. RIP Pete, we will all miss you. If it’s any comfort, Lisa, I don’t recall a greater outpouring of caring for anyone I’ve written about here. Your father was clearly very loved and an inspiration to many people, and will be very missed. I was very saddened to hear about your father when I went for donuts the other morning. I never officially met your Dad, however 90% of the times I went to Mission Donuts, he was always there with a smile on his face, a cup of coffee and a kind word for me and my son. I know the pain of losing a parent near the holiday due to an accident and I am praying for you and your family during this extremely difficult time. Pete was a legend. He was my Dad’s best cycling friend until he passed away a few years ago. Pete proudly afixed my Dad’s photo on his top tube in memory of my Dad. They used to “Ride the Bear” together as well as club rides. Thanks for that, Gail; you brought tears to my eyes. Clearly, we’ve lost a very good man. Unfortunately, “I just didn’t see him” seems to be the universal Get Out of Jail Free Card for distracted motorists. I would be very surprised if we see any charges in this case. Here in Portland Oregon there is a campaign to protect cyclists. Google it. When I lived in O.C. I had numerous near misses with cars while cycling. Here too in Portland as a pedestrian. As drivers, we should employ two different ‘checks/looks’ before entering intersections or making any turns or lane changes; one check/look to see other cars and an entirely different kind of check/look for peds/cyclists. “I just didn’t see him”….slang for “I wasn’t paying attention” or “I was distracted”….these are the people I worry about as my 85 y/o Dad rides 3 – 4 x’s a week. He won’t give up his bike just yet either. Prays for Pete and his family. Pete will always have a special place in my heart and in the hearts of my children. We too are regulars at his favorite hang-out, Mission Donuts, and countless times he bought donuts for the kids. He was especially kind to my son JJ who has been through multiple heart surgeries. JJ and Pete clicked, they understood each other. JJ loved to pull up a chair and sit with Pete and talk for a bit. Pete, you will be so missed by us. Ann-Marie – Hi, I’m David Whiting, columnist with the Orange County Register. I’m writing a column about Pete and hoping to learn a wee bit more; [email protected], 714-796-6869. thank you. I was so sorry to hear of Pete Tomaino’s passing. He was a fixture in our shared neighborhood and an inspiration for any-age fitness. Mrs. Tomaino was my now-grown children’s favorite aide at Lomarena Elementary School. I loved that David Whiting recognized and wrote about Pete in the OC Register as he truly captured Pete’s spirit and outlook on life. Pete wrote regularly in the “Letters to the Editor” also and I loved his succinct thoughts. A ghost bike and memorial at Ralph’s parking lot is reminding us of the fragility of life. Our thoughts are with his family. Can someone please take a photo of that for those of us not close? I believe this is it. And there’s another shot here. I had just left Ralph’s which was so busy with many shoppers. I drove by and saw the car accident that just happened as skaters from the skate park ran in front of my car near the car accident and divider. The accident car was facing backwards on the right side near the Community Center. I finished my errand and went back by Ralphs to deliver a present and saw the area taped off. It was within the same hour. 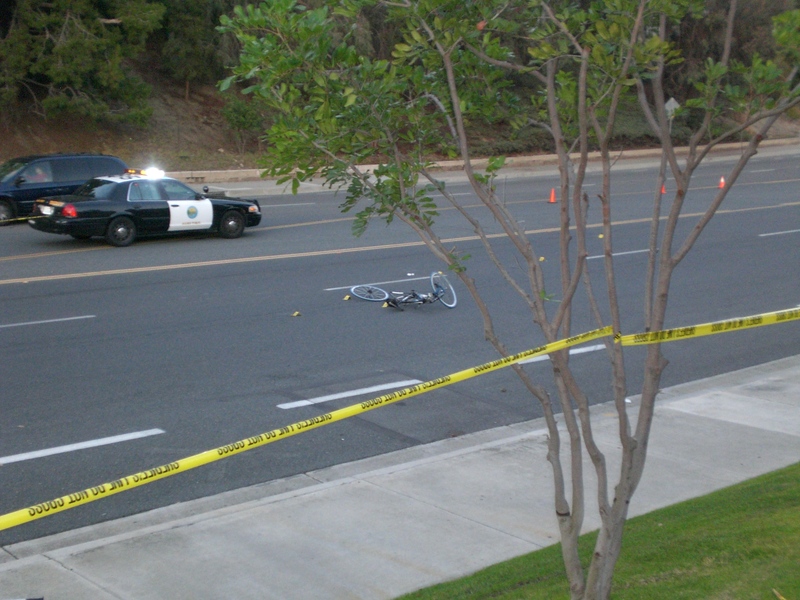 The car from the accident was gone and there was the bike near the Ralph’s driveway, alone on the ground. My heart felt sad knowing that the cars not moving nearby meant sadness for a Christmas Eve. Later, I drove by after delivering presents and there again the bike still on the ground, alone. I thought somewhere on a Christmas Eve, a family was having a sad Christmas changed by what had just happened. Within only a few days we saw the white bike and the sign “We love Pete”. Our hearts go out to Pete’s family and do pray for comfort. Just this week we met the new mayor of Laguna Hills at the Christmas house light display. He asked what can we do for Laguna Hills. Definitely now there is another need, a sign at that busy intersection. What else can our community do to protect more people at our busiest intersections? My Mom works at the Ralph’s which Peter frequented. She said he was an amazingly kind Man who absolutely glowed when he spoke of his Grandbaby. Someone placed a beautiful Ghost Bike and Flowers at the site. His Donut Family even laced a kind memory sign for him. He was truly respected & liked.